Back in 2009, on a hot summer day, I went to the Loews Cinema in Harvard Square (RIP) and saw the movie Julie and Julia. While I enjoyed the parts about Julia Child in Paris learning to cook and writing Mastering the Art of French Cooking, the parts about Julie Powell in NYC writing her through-cooking blog of Mastering the Art of French Cooking frankly bugged me. Maybe it was Amy Adams’s patented perkiness, or maybe it was the fact that this fool Julie had gotten not only a book deal but a movie deal out of her blog. Who can say? So I grumbled about it to my husband, Bryan, on the way home, and he proposed that if it bothered me so much, I should start my own through-cooking blog. When we got home, he pulled a book out of our bookcase full of recipe books. It wasn’t Mark Bittman’s classic How to Cook Everything, nor Alice Medrich’s Cocolat, nor The Betty Crocker Cookbook, nor even Mastering the Art of French Cooking. The gauntlet that Bryan threw down before me was the 1974 edition of General Foods’s The New Joys of Jell-O. Now, we had originally bought The New Joys of Jell-O because we’re fascinated by vintage cookbook illustrations, such as the cheerfully racist line drawings found in cookbooks of the fifties and sixties, and the dated and oddly colored photographs that appeared from the fifties through the seventies – the weirder and uglier, the better. The promotional cookbooks that were published to boost sales of various industrial food products are generally good sources for such graphic delectables, and we don’t buy them intending to try the recipes. Nevertheless, I’m not one to back down on a dare, so I started the Joy of Jello [sic] Project on WordPress, giving myself a year to cook my way through the book. How hard could it be? There are only 106 recipes, and Jell-O is pretty simple to make, right? It started off all right. I began by going in chronological order, which meant hitting the basics – Jell-O with Cool Whip dollops, cubed Jell-O, Jello-O with fruit suspended in it – all stuff we normal people ate as kids in the 1970s. When I hit the first savory Jell-O recipe, I realized that to get through this Project I was going to have to mix it up, because if Bryan and I had to spend weeks at a stretch sampling that type of recipe, we were going to go stark raving in short order. So I came up with a schedule that alternated inoffensive and scary-sounding recipes and soldiered on. The problem was, it didn’t help that much. Bryan complained about all of them. Summer too quickly turned to winter in New England. Our cat was elderly and sick and we had to let him go. About halfway through the Project, I had, well, a bit of a meltdown. The Jell-O was bringing me no joy. I deleted the blog. I deleted my local files. I went back to leading my normal, non-blogging life, and made Jell-O no more. While I was writing the blog, people sometimes asked me, “Why?” Once I was no longer doing it, people asked me, “Why aren’t you blogging about Jell-O anymore?” I guess the idea has a certain appeal. There’s a woman out there who attempted the same thing (in fact, she appears to have largely copied the format of my blog, stopping short of actually plagiarizing the posts) although she didn’t even get as far as I did. The Project haunted me for over four years after I tossed it. Then, on July 4, 2014, the topic of the Project came up at a party. Friends were telling me that they’d enjoyed it and wondered why I’d stopped doing it. One friend pointed out that I might be able to retrieve it using the Wayback Machine at archive.org. Finally, I was letting myself be talked into rebooting my Jell-O blog. I was able to retrieve 19 blog posts about Jell-O recipes I had made, sans photographs. I still had the raw photos in my iPhoto library. I had my handwritten notes from recipe number 13 on. I would still have to make a lot of Jell-O. This time around I relieved myself of the pressure of a time limit, and interspersed a few other (food-related) topics and other recipes not taken from The New Joys of Jell-O. Even with my newfound determination, the Project proceeded in fits and starts until March 2016, when I finally buckled down and strapped on the discipline to (mostly) stick with the editorial calendar I’d set out for myself. I posted the final recipe from the book (only a week late, due to illness) on January 7, 2017. Check out the Table of Contents. They’re all there, in all their joyous, jiggling glory. Whew! The question lingers: Why? The short answer: Why not? Hello there. After reading several pages on this blog, I just wanted to drop you a big thank you. You see, I found The New Joys of Jell-O cookbook at a thrift store last year, and after having read it from cover to cover with my jaw on the floor the whole time, I began to think that the Internet needed to know about the insanity therein. I decided that, if someone hadn’t already taken on the task, I would need to recreate and chronicle each and every recipe for posterity. But fortunately, you’ve already done it here! So thank you for sparing me and probably several other folks that tribulation. Now I feel content merely making the recipes that seem somewhat promising. 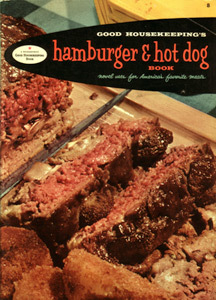 However, I do need to track down a copy of The Joys of Jell-O and find out if anyone’s recorded all of those recipes. One last note: while I like your theory about the GF R&D people going mad with boredom over the course of writing TNJOJ, I firmly believe that the more interesting recipes came about due to the equal quantities of Jell-O and LSD being ingested in the labs at the time.